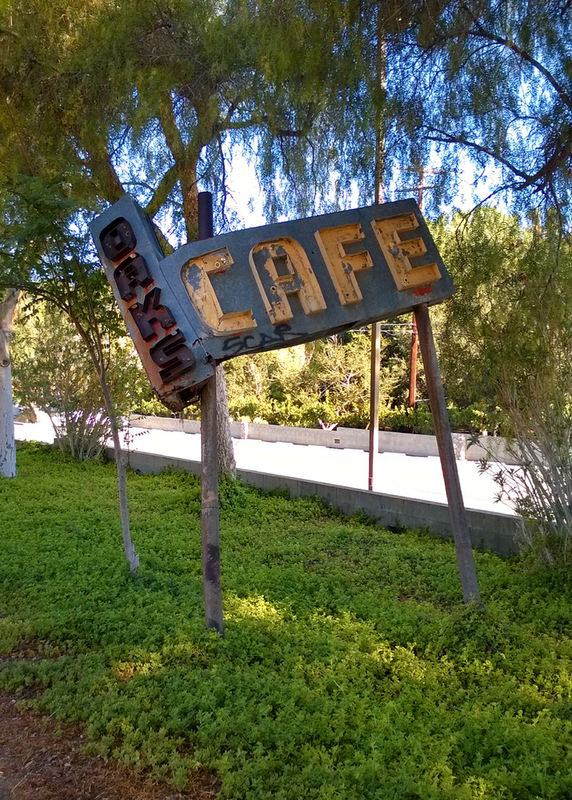 This relic of the Oaks Cafe, spotted in June 2014 by Acton historian Bob Buechner on the Le Chene property, is a reminder that we once used the English term for the restaurant. Le Chêne French Cuisine is a popular "destination" restaurant on Sierra Highway near Agua Dulce. The restaurant has been delighting customers with fine food and wines for 30 years. The translation of the restaurant's name "le chêne" means "the oak." This area has always been noted for its beautiful, centennial, oak trees. Starting in 1917, there has been a long tradition of naming businesses operating at this location after these magnificent oak trees. The stone building where the Le Chêne restaurant is today has stood proudly for 87 years. The site was originally developed by the Dodrill family in the early part of the last century. William Arch Dodrill was born in 1888 in Stevens Creek, Lancaster County, Nebraska. His grandparents had emigrated from England and settled in Virginia. His grandfather was in the Revolutionary War, was captured, escaped, and changed his name from Dodridge to Dodrill in order to stay in America. In June 1915, William A. Dodrill married Rachel Swanson at the Bible Institute in Los Angeles. Soon afterwards, they settled along what is now the Sierra Highway in Mint Canyon, just north of the present-day community of Sleepy Valley. They bought a parcel of land from Mr. Seeley who had homesteaded 160 acres there in 1912. The Dodrills built a roadside gas station which first opened for business in 1917. It started as a simple wooden building with a tar-papered roof, and with just one gasoline pump out front. The Dodrills positioned the building right next to a majestic oak tree, and called their new enterprise the "Oaks Garage." At the base of this oak, they built an outdoor refreshment stand selling bottled drinks such as Puritas brand Root Beer and Ginger Ale. The outdoor counter was subsequently enclosed in a small structure erected in late 1918 or early 1919. The family lived in a tent-covered home, set back directly behind this beautiful oak tree. This was a form of temporary shelter that was commonly used in that era. Their first daughter, June, was born during their first year of operation in 1917. Another daughter, Nellie, followed in 1921. The Oaks Garage faced a dirt road known at the time as Mint Canyon Road. In the early days, this route started as a pack-animal trail. During the 1910's, it was widened into a dirt road suitable for vehicular traffic running between Los Angeles and Lake Tahoe. In 1921, it was renamed US Highway 6. In addition to selling gasoline and motor oil to passing motorists, the garage provided automobile repairs. William Dodrill was a trained mechanic. The Oaks Garage also offered a vulcanizing service. This is a curing process for treating rubber with sulphur or sulphur compounds under heat and pressure to improve elasticity and strength. In the early 20th century, non-branded gasoline in the U.S. was often contaminated, or was of unreliable quality, so it was good business to be associated with known brands. The Oaks Garage sold Aristo motor oil from the Union Oil Company of California. Around 1910, Union Oil made a strategic alliance with a group of small oil producers, the Independent Producers Agency, to build pipelines from the Kern County oil fields to Union Oil facilities on the coast. This provided a more economical source of crude oil allowing Union Oil to be more competitive. This history was later fictionalized in the 2007 award-winning film "There Will Be Blood." 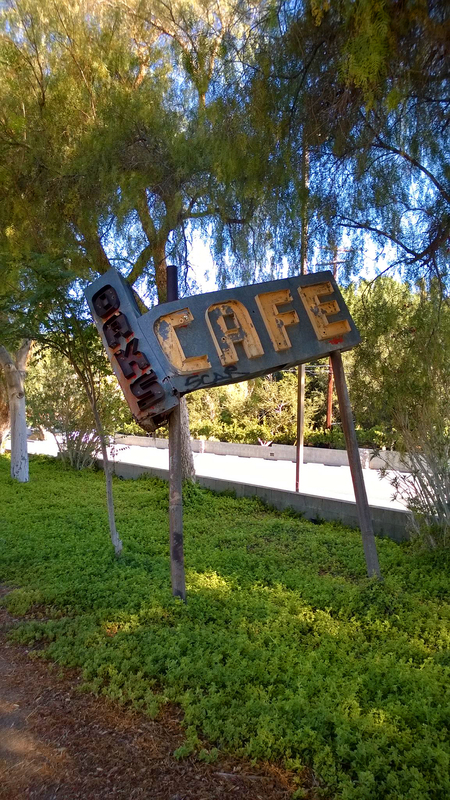 The Oaks Garage was a popular stop for day trippers travelling from Los Angeles to Palmdale or Lancaster, perhaps enjoying side trips to attractions like Vasquez Rocks and the Red Rover gold mine. The Dodrills also had a half ownership in a gold mine near Vasquez Rocks. It was also a place to stop for refreshments and supplies for longer trips to the Sierra Nevada Mountains. On the front of the Oaks Garage, they painted the distances to destinations of interest to motorists travelling along this route, namely Palmdale, Lancaster, Mojave, Lebec, Bakersfield, Saugus, and Los Angeles. After the first few years of operation, the Dodrills decided it was time to expand the business. Using a horse and wagon, a contractor hauled river stones from Big Rock Creek in the Valyermo area south of Pearblossom. This trip took two days to complete in each direction. In 1923, they extended the main structure by building a cafe that adjoined the garage. They used the stones to build the outer walls. Rachel's father, Gus Swanson, a bricklayer by trade, came to assist with the construction. These attractive, rounded stones gave the new building a castle-like appearance, and it quickly became known colloquially as the "rock house." It was subsequently referred to as the "Castle Oaks Garage and Cafe" on postcards from the time. A line of five new gas pumps stood in front of the new building. They had a public telephone booth right next to the gas pumps. Their telephone number was The Oaks No. 1. In those days, "first grade" Economy gasoline cost 17 cents a gallon. They accepted Standard Oil credit cards, and they offered a AAA tow truck service. As an eye-catching feature, they incorporated the large oak tree that used to shade the old refreshment stand into the front stone wall of the new building. It stood majestically between the garage on the right, and the new cafe on the left. A drinking fountain was installed at the base of this signature oak tree. Unfortunately, this oak was damaged by a truck in the 1960's and did not survive. It remained standing as a dead trunk until the end of 1980, when the last remnants were finally removed. Around 1936, a line of wooden cabins were built which are still there today. They were rented as overnight accommodation to passing motorists. After 30 years of successful operation, the Dodrills sold their Oaks Garage business in 1946. William Dodrill who almost 60 at the time, was suffering from poor health. The Dodrills' eight grand children are proud of their grandparent's achievements. They would dearly love to have the building recognized as a historic landmark. The new owners were Chester and Marie Lamar. They owned The Oaks establishment from 1946 to 1957. They paid $25,000 in cash for both The Oaks and the property across the street. They ran the business for eleven years as a gas station, garage, tow service, ambulance service, wrecking yard, bar and restaurant. They kept horses, cows, and pigs. The pigs ate the leftovers from the restaurant. At first, they lived in two of the cabins next to The Oaks, while renting the others. They built a storage building across the street in early 1950's, and later built a home there as well. A little known fact is they ran a water line under Highway 6 to supply water to this property. Around 1949 they changed to Mobilgas brand gasoline. In order to get the account, the Mobilgas salesman made a deal where he agreed to exchange the old hand pumps and replaced them with new electric gas pumps. Marie Lamar had a sister, Shirley, who was married to Ray E. Jones. Ray and Shirley were original business partners in The Oaks for about 6 years until the couple were divorced. Shirley ran away with the cook, Russell Winenger, whom she later married. After the divorce, Chester and Marie Lamar bought out their partner's share in the business, and they became the sole owners around 1952. The Oaks was destination for many of the movie stars of the day. Roy Rogers and Dale Evans used to come by in their jeep to fill up with gas. William Boyd (Hopalong Cassidy) visited with his crew when they were shooting movies at Vasquez Rocks. "Hoppy" even used to help Marie Lamar in the kitchen. Jane Wyman would sit in the café and study her scripts. Mickey Cohan, the crime boss, was also said to have conducted business while dining at The Oaks Cafe. He was a regular customer. Clark Gable would park his motorbike out front and eat in the cafe. The Lamars' grandson, Fred Sohegian Jr., relates a story about Clark Gable: "The Oaks was jammed, and Clark Gable was sitting at the counter. My grandfather always was in the garage or driving the tow truck or ambulance. If a cook didn't show up, or they got busy, my grandmother would go get him to work, which he didn't really like. He was waiting tables and Clark Gable stopped him and said I have been waiting for service, and do you know who I am! My grandfather said I know who you are, and then asked if he knew who all these men were sitting at the counter and tables...Clark Gable says no I don't. My grandfather told him that these were his regular customers and he can wait his turn and kept going." During the 1940s, popular motocross events attracted other notable visitors from the Beverly Hills Motorcycle Club including Gregory Peck, Wallace Beery, Keenan Wynn, and Lee Marvin. They came to ride their motorbikes in the hills across the street, or to watch the events. Other motorbike clubs that would visit from time to time were 13 Rebels, Galloping Goose, and the Hells Angels. The Lamars sold beer and sodas from coolers to the spectators at these events. The roadway outside The Oaks would get so crowded with vehicles that police officers from Newhall had to be sent over to direct the traffic. In 1957, Chester and Marie Lamar divided the property and sold it separately. They sold the "stone building" to Cindy Ferrero who ran it as a road-side diner and bar. She is described as a character reminiscent of the actress Zsa Zsa Gabor. The Lamars sold the remaining property across the street to Shanna Viervisen in 1959. She still lives there today, now 93 years old. Afterwards the Lamars moved to Fillmore, California, where they lived until Chester died in 1995 and Marie died in 1998. They were married 74 years. In 1971, the Oaks building was made famous by the movie director, Steven Spielberg. He used it as a location in his feature-film debut, "Duel." Now a cult classic, the success of this movie helped to establish Spielberg as a director. "Duel" is the gripping story of a business commuter (Dennis Weaver) who is pursued and terrorized by a tanker-truck driver who tries to kill him with his truck for no apparent reason. The recognizable Castle Oaks building was the location for Chuck's Cafe, a truck-stop diner featured in the movie. Several scenes were shot there, both inside and out. "Duel" was first released as a 74-minute, made-for-television movie in November 1971. It was so well received by audiences that the producers asked Spielberg to shoot an additional 16 minutes of new material so a full feature-length version of the movie could be released theatrically in several countries around the world. The movie was nominated for a Golden Globe award, and won an Emmy. By 1975, the building was known as Margie's Truck Stop, a business run by Marjorie Detterich. In 1979(? ), Sandra More-Lang purchased the property. She is the owner of Bullwinkels gifts and antiques in Agua Dulce. The current owner of the "Castle Oaks", Juan Alonso, leased the building in 1980 before buying the property the following year. In September, 1980, he started what is now the renowned Le Chêne French restaurant. In 1987, Juan Alonso completely renovated the old garage area and turned into a banquet room for special events. The kitchen was enlarged, and the whole building was brought up to earthquake code. In 1990, a new dining-room wing was added, and the bar upgraded. It was also the year the garden area was landscaped and planted. Juan Alonso has established a vineyard adjacent to the restaurant producing truly excellent wines. This wine-growing area was just awarded its own appellation, Sierra Pelona Ridge. The restaurant has large underground wine cellars and boasts one of finest wine lists in California. Even the original mechanic's pit had been used as a cellar to store wine, but was filled in just last year. The Le Chêne French restaurant will celebrate its 30th anniversary on September 8, exactly 30 years to the day of its original opening. Peter C. Gray is a freelance writer and amateur historian living in Agua Dulce. BB1401: 19200 dpi jpeg from digital image June 2014 by Bob Buechner.